Decades of economic rationalism have undermined our way of life for ordinary working people. The fetish nature of de-regulation, privatisation and liberalisation has created the conditions where the worst instincts of the business-classes have been revealed. And they still cry poor! 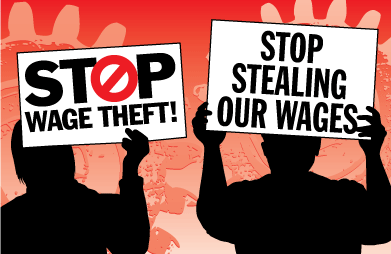 Wage-theft is rampant, not only with non-payment of wages. The problem runs far deeper: into our terms and conditions of employment. The problem of employers being found to not be paying workers the agreed amount with their wages is a far greater problem than many people think. There have been structural changes in the Australian workforce - the outcome of business practices emphasising economic rationalist thinking. The pursuit of de-regulation, privatisation and liberalisation which has accompanied the throwing of finance capital, by the business-classes, to the four corners of the globe has also included failure to honour legal obligations, both in Australia and elsewhere. A recent study conducted by the University of NSW together with the University of Technology Sydney, for example, has revealed, 'a silent under-class of vulnerable Australian workers', who are, 'owed an estimated one billion dollars', in unpaid wages. (1) The study, conducted from a survey of 4,322 temporary migrant workers from 107 countries found the problem widespread and not confined to small non-payments by employers; many of those concerned were only paid about half of what they were entitled, with payments of only $12 an hour. The study also excluded 457 visa workers - had they been included the final amounts of unpaid wages would have been even higher. From a trade union perspective, it is important to note many immigrants into Australia also come from socio-economic backgrounds where trade union membership is not common. Those concerned find their way into blue-collar employment in Australia usually because their qualifications, while acceptable for immigration purposes, are not validated through Australian professional associations. The high cost of re-validating professional qualifications through universities remains exorbitant and often not even worth the initial financial outlay. Once in blue-collar occupations, many remain on shop-floors for many years, not because of choice, but basic financial reasons. A further important consideration to remember is that many immigrants entering Australia come from countries where it is not usual for a worker to challenge an employer due to personal security considerations. In the Philippines, for example, over a thousand trade-union activists have been killed in recent years for organising workers. In other countries, including Colombia and India, it is extremely dangerous to be associated openly with trade-union activism. Australian employers have taken advantage of this problem to enrich themselves. A recent finding that food delivery company Foodora had underpaid its casual workers by more than $8 million, despite amassing a revenue of $1.2 billion this year, has clearly shown dominant thinking of those within the business-classes. The fact Australian tax-payers are likely to have to foot the bill for the German-based company is a further factor to be taken into consideration; those from overseas exploiting Australian workers remain outside the jurisdiction of our legal channels. (2) There remains little wonder why Foodora shareholders must be laughing all the way to the bank. Employers have cultivated a habit of crying poor, even though company profits continue to increase. Continued attempts, by the business classes, to undermine penalty rates and shift-loadings are but two examples. While most Australians honour the notion of a fair go for immigrants, the business classes continue to undermine our way of life. Structural changes to the Australian employment now include temporary migrant workers accounting for 11 per cent of the total workforce. (3) A further twenty per cent remain on the national minimum wage of $719.20 for a 38-hour week. (4) Both groups include the working poor where wage-levels fail to meet normal household costs, together with limited credit worthiness for raising loans from banks. Buying their own home, even a small apartment, would be extremely difficult if not impossible for those concerned. And as if those figures are not appalling in themselves, there is also the theft of terms and conditions of employment and incorrect classification of duties to establish the correct wage levels. All workers in Australia are covered by Award conditions, which clarify basic wage levels and terms and conditions. Only three-quarters of the workforce are covered by enterprise bargaining agreements (EBAs) which provide above award entitlements. The 2010, Manufacturing and Associated Industries and Occupations Award, which covers large numbers of workers in production, manufacturing and assembly jobs, has fifteen pages of different allowances ranging from rest breaks and meal allowances to compensation for damage to clothing and spectacles. (9) It is a common problem for casual workers, particularly those who are young or immigrants, to not be informed of their entitlements. A further nineteen pages of the Award deal with correct classification of duties performed at work; most workers in the industries concerned, however, only ever receive payment for C13 work duties while their employers expect them to do far more without further payments. (10) A C13 pay grade is only supposed to be used for a simple, repetitive job, with minimal responsibility. A re-classification, from a C13 to C12 or C11, provides a worker with a wage increase of $50-$100 per week together with a career pathway for further promotion. Experience has shown most of those actively involved within the trade-union movement, employers and those associated with labour hire agencies, rarely, if ever, consult an Award Book. Evidence of the extent to the problem can be seen in the case of one South Australian-based multi-national company with sales and profits nudging $100 million attempting to take a $50 a week allowance from a Material Handler without even reading the relevant section of the Award or taking the Competency Standards into account. Usual procedures for consultation were also not used by the company. The example, however, is the mere tip of a huge iceberg; many workers are now also employed in businesses where there is little trade-union organisation, they are also unaware of their entitlements. The theft of terms and conditions of employment together with correct classifications, is likely to affect a majority of Australian workers: it is hidden wage-theft. The Universities’ study of under-payment of wages used the explanation that there was a culture of impunity for wage theft in Australia. It is not particularly difficult to establish why and how the problem has arisen. The problem of there being only two hundred inspectors being employed to enforce workplace laws for more than twelve million workers has also led to some employers being willing to take a chance to put employees' wages and other financial considerations into their own pockets. A study conducted by the Fair Work Ombudsman has also revealed almost forty per cent of businesses caught breaking workplace laws, including under payment of wages, continued to conduct their appalling business practices even after being re-audited. (13) Even after being caught once, those concerned continue to take the chance of not being caught a second time. In conclusion, the problem has clearly shown the business-classes have too much power and no respect for ordinary working-people. The system in which this exists, is clearly broken and dysfunctional. It’s time to Change the Rules to enforce the business-classes to honour their obligations, once and for all! It’s also time to consider changing the system so that the private ownership of the means of production is abolished and with it, the incentive to cheat workers of their wages and conditions. 1. Suffer in silence: unclaimed pay likely $1 billion, The Age (Melbourne), 29 October 2018. 2. Taxpayers face hefty bill for Foodora's $8m debt, Australian, 9 November 2018. 3. Age, op.cit., 29 October 2018. 4. Australian minimum wage, ABC News, 1 June 2018. 5. Private sector left behind as pay rates jump, Australian, 15 November 2018. 7. Most lack full-time jobs with benefits, Australian, 29 May 2018. 9. The Manufacturing and Associated Industries and Occupations Award, 2010, pp. 79-93. 10. Ibid., pp. 132-159, and, page 136, Section B. 3. 4; see also, National Metal and Engineering Competency Standards, SA Manufacturing. 11. Ibid., Award, page 65, Sub-section 24.3, Higher Duties. 12. See MEM 11011B Undertake Manual Handling, together with, Section 11, Competency Standards, op.cit. 13. Businesses rorting pay still at it on second audit, Australian, 9 November 2018. 14. Age, op.cit., 29 October 2018.